Much like the BrewDog IPA is Dead range, Mikkeller's Single Hop Series aims to educate the average beer drinker about the different flavours and intricacies of different hop varieties. Work was one again very busy and by 6pm on a Friday I'd just had enough! Home I came and straight into this range of beers. As a big IPA fan I'd heard lots of things about different beers in this range. This evening I was sampling 6 of the range which currently stands at a huge 19, I would imagine it's the biggest range of it's kind in the world! The BrewDog equivalent was excellent so let's see how Mikkeller stacks up. The first one I sampled was the Centennial Single Hop IPA. Centennial is one of the most widely used hops in IPA's, especially North American ones, and provides a very distinctive grapefruit aroma usually. The colour of the beer is quite unusual, I'm going to call it an orangey copper but you can make up your own mind from the picture. The head also has an orange tinge and is an impressive size. Unsurprisingly both the nose and flavour are dominated by grapefruit zestiness. This particular IPA is a bit more malt driven than I would have expected for a series trying to showcase different varieties of hops. Anyway this beer does it's job; it showcases Centennial well and is quite drinkable. 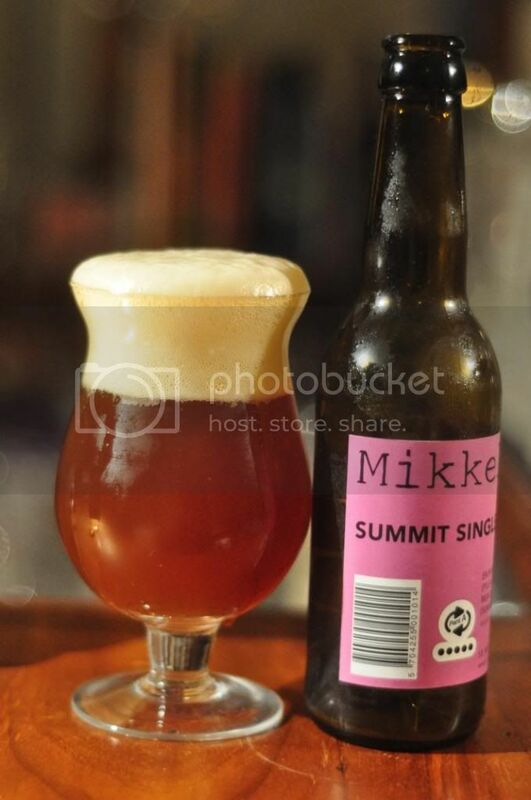 Next up was another North American hop this time it was Summit, a hop varietal that I was initially unfamiliar with. Some research showed that this is actually the highest alpha acid hop (17-19%) on the market at the moment. 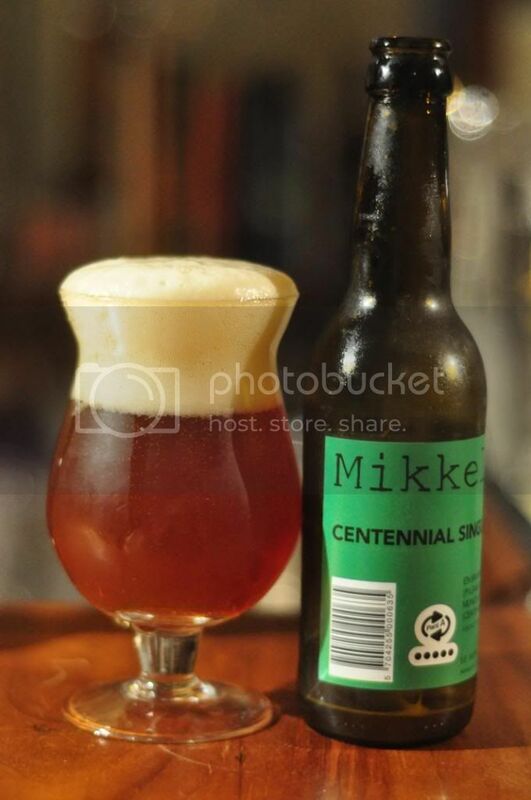 The pour is almost identical to the Centennial, with similarly excellent head retention and lacing. The nose was disappointingly more malty than hoppy with burnt caramel aromas the most evident. The hops that are there smell slightly floral and slightly citrussy. The taste is similar, not enough flavour from the hops and the odd malt base takes too centre stage. 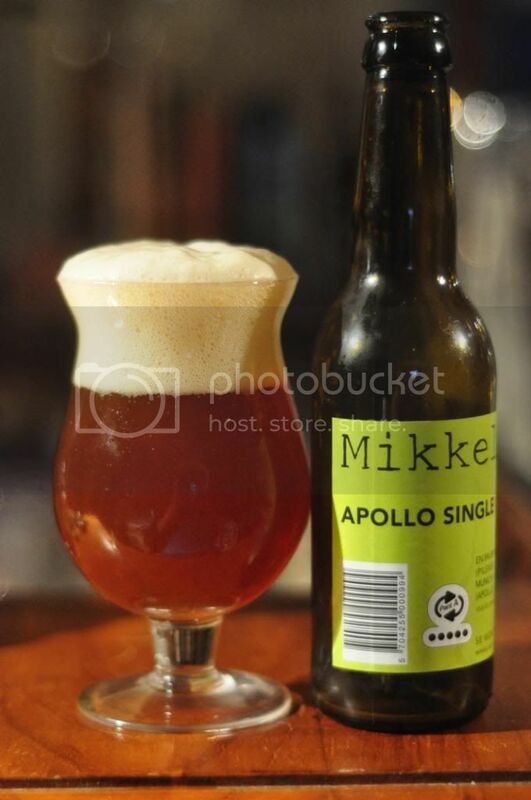 A disappointing Single Hop attempt from Mikkeller. I then took on the Amarillo Single Hop IPA. Australian drinkers would be familiar with this hop as it's used in James Squire Golden Ale. Other well known beers that use Amarillo include BrewDog 77 Lager and Rogue Yellow Snow IPA, which only uses Amarillo. The pour is again almost identical maybe this one has a slightly weaker head. 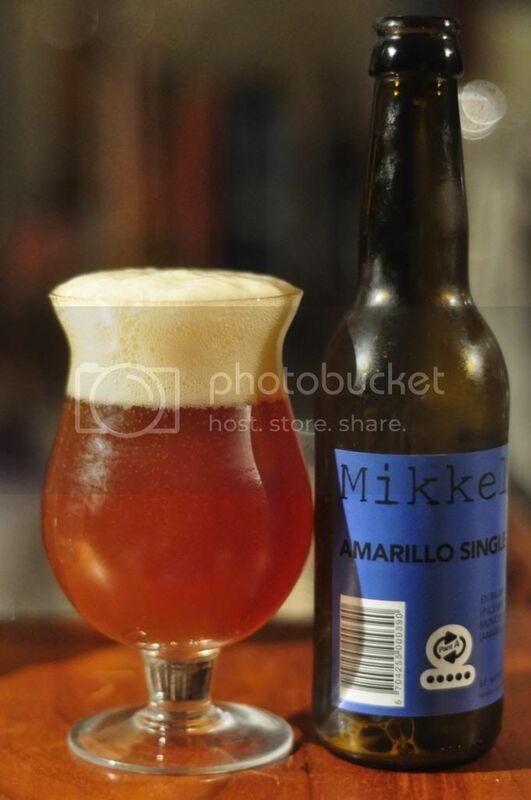 Mikkeller's Amarillo Single Hop IPA is the best one I've had so far. This is a proper IPA, there's plenty of bitterness provided by the hops and is also nice and dry. The citrus flavour of the hops comes through strongly and there is also a hint of apricot. This is a really drinkable IPA! Apollo was up next and this hop is probably best known for it's resilience. Not only does this hop age remarkably well but the plant is also resistant to hop powdery mildew in Washington, it's biggest growing area. The pour is again almost identical to the previous beers but is maybe a tiny bit hazier. This beer had plenty of citrus on the nose but then really disappointed when it was tasted. The hops seemed a little timid and even the malts, that seemed a little strong in some of the other single hop IPA's, seemed muted. Overall it was a beer that I expected alot more from and now feel a little let down by. Fifth in my journey through 6 of Mikkeller's Single Hop Series was a hop varietal that I'm not 100% sure should be included. 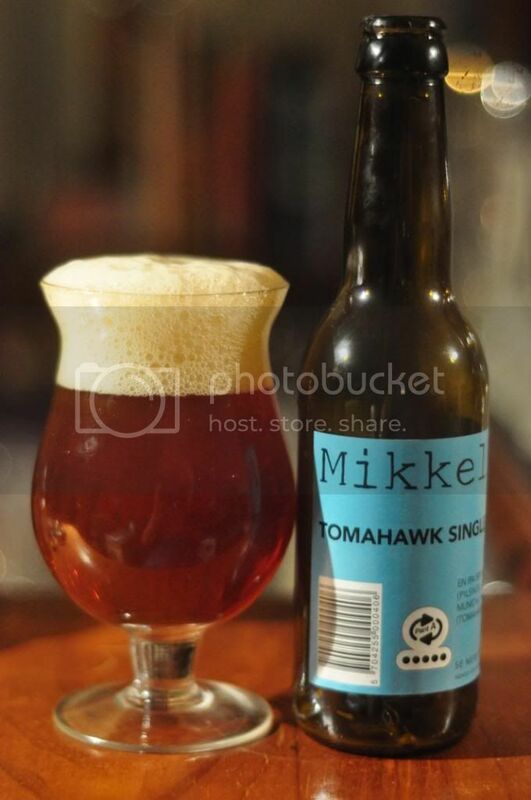 From my understanding of it Tomahawk is just another trade name for Columbus and they have made a Columbus Single Hop... Anyway semantics aside this is the best looking of the IPA's, it's just that tiny bit clearer. I wish I had the Columbus one now so I could compare them, but the Tomahawk one is very good. The nose emits notes of pine, spice and naturally citrus. The flavour is similar, with the spicy hops starting alongside the malt base before the citrus and pine elements take over. This is an exceptional example of one of the best known varieties out there. I've left the best, or what I hope will be the best for last. If nothing else Sorachi Ace should be the most distinctive hop of these 6. 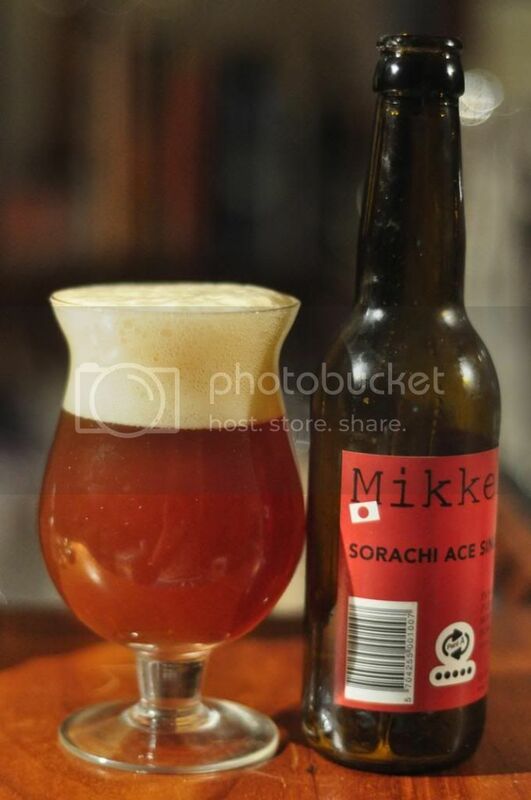 Sorachi Ace is a Japanese variety of hops and was relatively unknown outside of Japan until 2008, when a hop shortage in the U.S. meant it got more exposure and use in brewing. The nose yields plenty of the typical Lemongrass flavour you expect from beers which utilize Sorachi Ace hops. Unfortunately the flavour of the hops get lost a bit in the caramel malts which are a little too strong for this relatively gentle flavoured hop. It was definitely the most distinctive of the 6 beers on offer tonight but I don't think the beer showcased the hops as well as it could have. 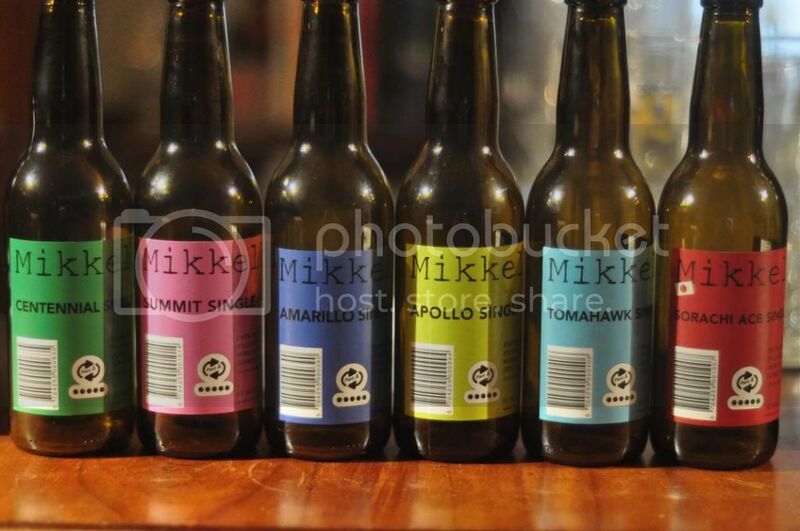 First and foremost, I think I should give credit where it's due, well done to Mikkeller on crafting 6 very good IPA's which all look very close to identical. This shows me that the malt base was close enough to identical on all of them, which would give the hops the best chance to shine on a level playing field.